This verse has been drifting in and out of my thoughts all week and I found myself constantly in awe as I pondered over and over again the Christmas message it declares. For love, God left heaven and came to us as a child, born of a virgin, to dwell among us, to walk with us, to teach us, to heal us, to guide us back to truth...and eventually to die for us. Isaiah 7:14 prophesies the coming Messiah - "The virgin will conceive and give birth to a son, and will call Him Emmanuel." 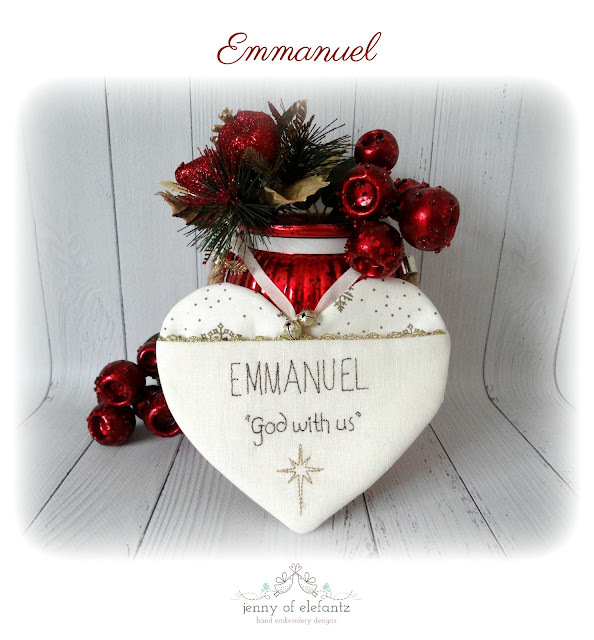 Emmanuel means "God with us" and indeed that is what happened when Christ was born of Mary and made a life here on earth. 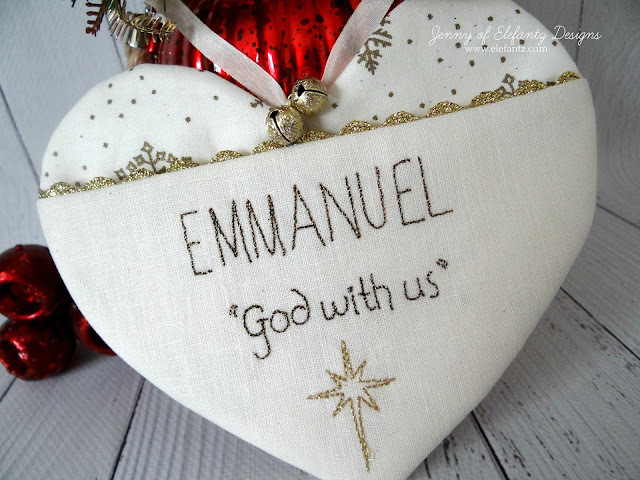 Dwelling among us for 33 years Jesus lived and walked and breathed and died as a man yet He loved, healed, forgave, humbled, taught, and rose from the grave as only Emmanuel our Messiah could. One of my very favourite songs from the past few decades is His Kingdom and as I pondered these thoughts on Friday I stood in the kitchen with arms raised and sang it with tears streaming down my face...the enormity of Who He Is and what He did overwhelming my heart. Nothing, nothing at all compares to Jesus and what He has done for me. I think those precious moments in God's presence, singing from my heart to His, inspired this simple design. Only words...but what marvelous words, powerful words, truth filled hope-fulfilled words! May Jesus bless you as we move closer to the celebration of a Gift no other can equal, and though December 25th is not truly the day of Christ's birth it has become a day when we can choose to turn our thoughts from the way of the world and look up to Him who came down to walk with us. Too many have forgotten, turned away from or discarded our Lord, but that baby in the manger was real and He truly is the Son of God, Emmanuel, the Saviour of the World. Love came down to save us and Love's name is Jesus. Celebrate and give glory to Him this Christmas season and teach the little ones how much He loves them and how blessed they are to have a friend in Jesus. A very blessed Christmas season to you and your family. Thank you for all you share with us! Oh Jenny. If ever God gave you gifts, it is the gift of encouragement. As I get dressed to go worship our Great King Jesus I listened to this and read your words, and I joined with you in tears to worship where I am. Thank you, and the Lord Bless You and your family today. Gracias por compartir y abrirnos tu corazón, Jenny. Gracias también por el enlace. Nunca había escuchado esa canción. Bellísima. Recibe un fuerte abrazo. How Beautiful Jenny. Have a wonderful Christ centered Christmas. May you always be blessed every day as a humble servant to Christ.May all your needs be met and some of your wants as well. I can think of no other so deserving. Love you always my sister in Christ and Stitchery. We are having a extremely wet and cold day in the South here in The US. It has been a emotional week of prayer for me here this week praying and thanking for blessings. So thankful for so many things in this life. others in my shoes would be angry mad and upset me I am truly thankful for each day and each gift no matter how small. Sun shining, birds singing, family members ...etc...I am truly blessed my Lord and Savior. Thank you Jenny ... I had not heard that song and it was beautiful. Christ is the only reason for Christmas!! As you have blessed others, may you be overwhelmingly blessed by God, every day! Dear Jenny, I have a lot of pet peeves about this season we are in. Like right now being Advent and Christmas starting on the 25th and going to Epiphany not the day after Christmas! Also that the "Wise Men" were not at the manger! They didn't show up until Jesus was 2 or 3 because the star only happened the night Jesus was born. On my Creches I always put them far away from the manger scene. I would appreciate a Creche that had a whole lot of Shepherds as they were the ones who actually showed up. Why am I going into all of this? My favorite Hymn for this time of year is Oh Come Emmanuel! Your simple yet beautiful pattern would be perfect for my kind of decorating. It expresses what I want to say at this time of year. I would have paid for it. Thank you so much for your generosity. Hello Jenny, Thank you for sharing such a special time in your life and sharing these important messages to help us live closer in our faith and to become stronger and share the spectacular meaning of Jesus. Have a fabulous day! This was the text of our sermon this morning. "God with us". Thank you for posting this. Thank you! This is beautiful! Merry Christmas and blessings in the hew year ahead. Jenny, such a beautiful design, so very representative of the worth of the son of God. We cannot give thanks enough, we cannot give back love enough, to ever equal Christ's. I'm grateful for my Savior, and I'm grateful for you, my friend who values Christ so highly. Thank you for the design and for your ministry. Jenny the red flowers without leaves are spider Lillys. They are expensive in Texas often costing $5.00 apiece. We used to find them planted around old homes. They are slow to multiply. We Love them. I like it. So pretty. Thank you. Thank you Jenny Dear. May God be with each of us in our life journey. Thank you, Jenny, for the heart design and for introducing me to a new song. That's such a lovely post Jenny and so true. People seem to have forgotten what Christmas is about. Sadly so many now don't even know what it's about as schools in the UK have to be so politically correct most don't even have a Nativity play. For me it isn't Christmas without going to Mass that's the whole point of it. Your posts are always so uplifting Jenny thank you so much for sharing your thoughts and prayers with us. Thanks also for your beautiful embroidery gift. For your grandies look up Colin Buchanan - The King of Christmas - for the children but a favourite for all of us & the message is for young and old. God bless. 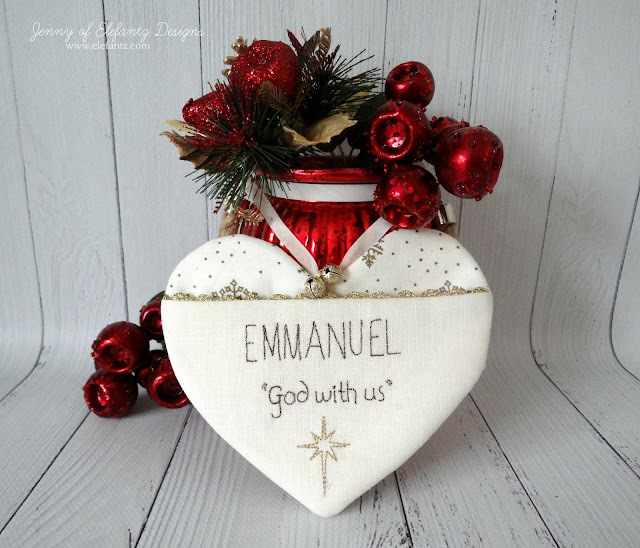 I love the HEART design I have downloaded the photo and shall use as a Christmas card!